I’m no sailor but I know that when you’re on the open seas and using the wind as your driving force, the problem isn’t going into a headwind – even energy going opposite to your desired trajectory can be channeled in a useful way. The problem is when there is no wind, no motion…. You can’t leverage stagnation, but a gust in any direction can help you discover what you’ve been looking for all along. I was not a happy camper while drawing today. Nothing was going right. It was a classic autumn day alternating dark clouds and bright sun, so the light I need to photograph my sketches kept changing. I couldn’t get my tripod positioned right. Once I started sketching, I felt that I had begun wrong and should start over. I fretted that this choice of hand position (right) was inappropriate for your fourth drawing tutorial. So did I stop and start over? No, I kept moving forward, trying every trick in my bag to get the drawing back on track. And eventually it did improve – thanks not to a single brilliant insight, but to dozens of small steps as I slogged ahead. I won’t be showing this drawing at the Metropolitan, but it works fine. I’ve learned over my years of doing art that when things aren’t going well, I simply need to keep working, moving forward. Eventually the drawing will get better. It’s a matter of time and determination. A few weeks ago, I read the sailing analogy quoted above and immediately resonated with it. It’s absolutely true that sailors can move forward using wind in any direction, even a headwind. The real problem is when they’re becalmed, when there’s no wind at all. So, too, when you’re drawing: each line you make will help you figure out what you need to do next. Even if that line turns out to be wrong, making it will help you understand where the right one should be. If you make five or ten wrong lines, use each one to learn what the right one is. Rough position of my hand for this sketch. The photo was taken in somewhat different light than when I was sketching my hand. Please refer back to the relevant sections of Hand drawing tutorial one for this info. This hand position is somewhat similar to last week’s. The main difference is that I’ve raised my forefinger so that it appears to cross over the middle finger (of course it doesn’t actually cross over). My goal here was for you to try a hand pose that doesn’t have the series of small negative spaces between the fingers that we’ve had in every tutorial till now. For this reason, this position will be more challenging than the first three we’ve sketched. I think it will be easiest for you to see how I worked on this drawing if you go through the time-lapse video while reading my commentary. I’ve numbered each frame so you can easily match it to my description (beneath the video) of what I was doing. You may want to open a second copy of this post in another window so that you can place video and text side by side. Frame #1: In earlier hand tutorials, I haven’t drawn this particular negative space – the flattened triangle formed by the edge of my finger and hand – till after sketching the spaces between each finger. But in Demo #4’s hand position, the negative space between fingers is much larger, hence not as easy to draw. So I start with an easier shape: the one at the left edge of my hand. There’s no rule about where you “should” start a drawing. Just start it wherever you notice an easily-drawn shape. 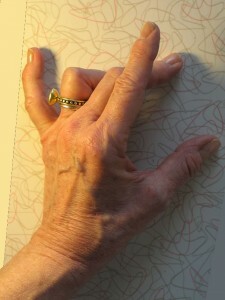 Frame #2: I begin sketching in the negative space formed by the pinky and forefinger at either end; an imaginary line connecting these two fingertips at the top; and the two bent middle fingers at the bottom. Frame #3: It’s hard to judge the correct size for a negative space this large. So to check the size I sketched in frame 2, as a measuring device, I sketch in a few lines of the middle fingers. Frame #6: By this time, it’s clear I’ve gone off somewhere. The base of the hand I’ve drawn is much too wide. Frame #7: So I check both sides of the hand and decide it was my Frame #1 triangle that was off. I erase the old left side of my hand and sketch in a new one. As I’m checking proportions, I realize I’ve also made the base of the middle finger too wide. Compare my sketch with my actual hand (photo above right). This error is in the very center of the drawing. To correct it, I would have to erase either the entire left or the entire right side of the hand I’ve drawn. Arghhh! Should I chuck this drawing and start over? How can I publish a drawing that’s this incorrect when I’m trying to teach the right way to draw? But I’ve been having so much technical difficulty with the sun and camera equipment – it’s that part that I don’t want to struggle again with. I decide to experiment with continuing this drawing. It’s not going to be perfect, but I realize that you may learn as much from how I handle a somewhat out-of-whack drawing than how I handle a better one. Frame #8: Rather than agonizing more, I move on to shading the drawing as it stands. Frame #11: To help disguise my “fat” middle finger-base, shading will be key. I’ll be paying close attention to it over the course of the rest of this drawing. Frame #13: That darn bright sun suddenly appears from nowhere, sending a shaft of bright light across the middle of my sketch! Frame #18: Here I make another mistake, which I didn’t notice till after I finished the drawing (so it’s still there in the “finished” sketch). I didn’t trust my initial drawing of the length of the pointer, which I had made accurately in Frame #3. Here I lengthen it slightly, and it gets too long. Oh, well! Frame #20: I erase the guidelines I drew early on to help me determine the relative length of the various fingers – or, more accurately, the shapes of the negative spaces between the fingers. At some point during the shading of a drawing, these lines always become distracting, so I erase them. Frames 21-35: I continue to try to make all the other proportions – wrist, thumb, middle finger tip – very accurate, to distract from that fat finger in the middle of everything. I also work on fairly detailed shading, with a full range of darks to highlights. This gives a sense of 3-dimensionality, hence reality, that can fool the viewer’s eye into overlooking awkward proportions. So sail on, artists! Keep moving through as many practice drawings as you can. Over time, this “wind” is what will get you to the destination you seek. Are there particular parts of these lessons that you find really helpful? Others that you find a waste of verbiage? Let me know what you’d like more and/or less of by leaving a reply or comment below. This is the third in a series of online drawing lessons using your hand as your model. The first, most basic lesson is here. The hand is so complicated visually, so able to move its parts in infinite ways relative to the various other parts, that a small movement creates new shapes and new challenges in drawing. And your hand is always available to “pose” for you! At the end of this lesson, you’ll find a time lapse photo sequence of my entire Tutorial #3 drawing process, from my first pencil line to the finished sketch. Please refer back to the relevant sections of Tutorial #1 for materials you’ll need and how to set up your work space. I chose this rather odd position of my hand because it produces an interesting variation in the negative-space shapes (between the fingers) that we’ve been working with so far. To place your own hand for this drawing, focus on the spaces between your fingers. You may not be able to replicate the shapes of the spaces exactly as I did them, because your hand is probably a different size and shape than mine. Just place your hand in a position close to this. The goal is to create varying shapes in the spaces between your fingers. That may seem like an odd goal. But remember, I’m trying to get you to switch the way you’re seeing to a different mode – what Betty Edwards calls right-brained mode. Right-brained seeing is all-important for many artists’ drawing process. But the switch isn’t easy for the human brain to make, as I explain here. 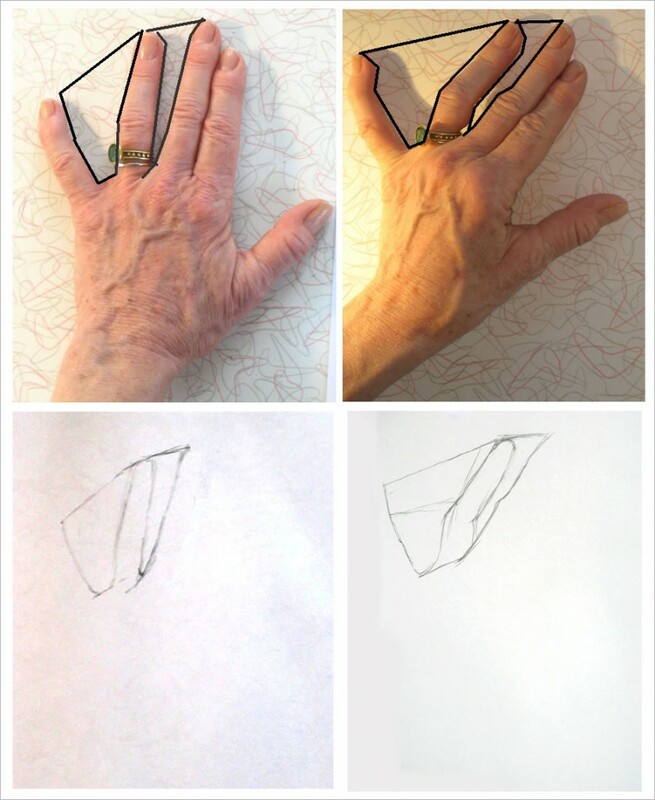 To prime your brain to switch to seeing in right-brain mode, look at the different shapes between my fingers (below). Between the ring and middle fingers is a small triangle. Between middle and pointer fingers is a more elongated shape. And between forefinger and thumb is something like a teardrop shape. In addition, there are small triangles between the tips of the fingers. Focus on the space between my fingers, indicated in green in the middle image. On the far right are the green "negative spaces" without a photo underneath. Note the variety in their shapes and positions. This is what you will draw first. Now look carefully at the spaces between your own fingers. What are the different shapes and sizes of the spaces your fingers create? That’s what you’re going to draw first. 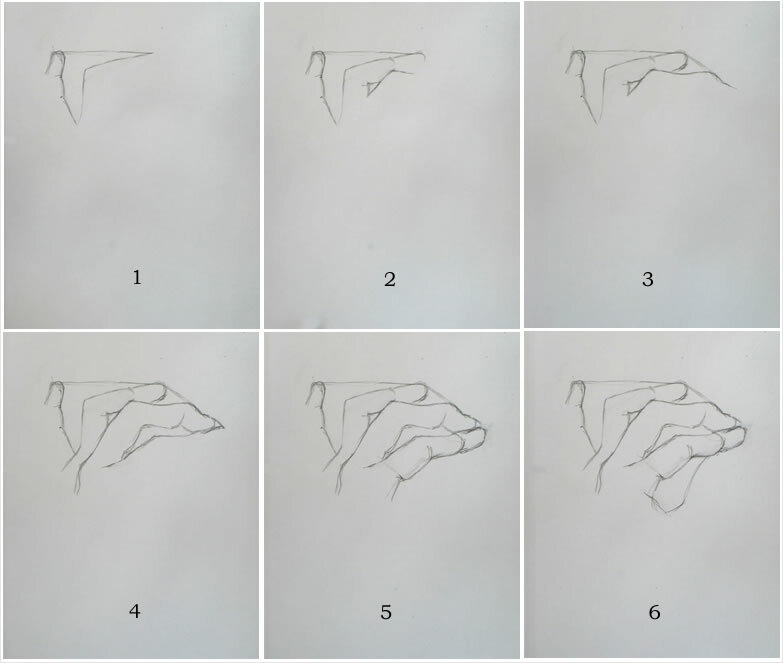 The sequence below shows how I began my drawing with the negative spaces between my fingers, moving from left to right. It may also be helpful for you to watch this process in the time-lapse video at the end of this post. This sequence shows how I first drew the negative spaces between my fingers. To help you judge where you should draw each line, notice where the sharp angle of each finger “fits into” the previous finger. For example, the sharp bend in the ring finger occurs opposite the middle of the top segment of the pinky (Image 1 above). The sharp bend of the middle finger overlaps the ring finger halfway across the ring finger’s top, straight edge (Image 3 above). The pointer’s sharp bend is very close in shape to the underside of the middle finger’s bend (Image 4 above). In this demo I draw more joint details of some fingers, compared to previous, simpler hand position negative-space sketches. At this early stage in the sketch, you don’t want to put in too much detail. 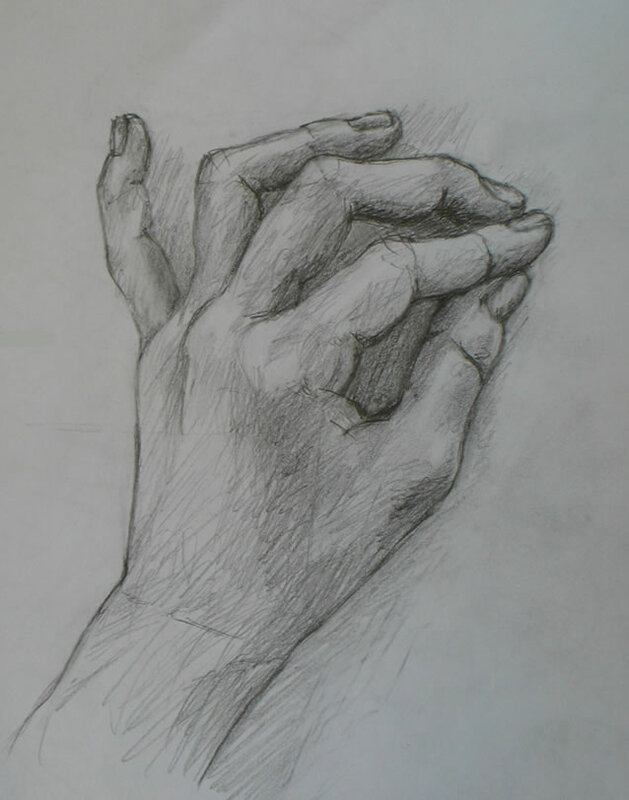 You want to first sketch out the basic shapes of your hand. So at this early point, I’m drawing the finger-segment details solely as a measuring device. They help me judge the size and shape of the negative spaces I’m drawing. Later in the drawing process (see Tutorial #3 video below), I will continue to draw in more of the tiny wrinkles that form each finger-joint. Each time I did this in this particular drawing, my purpose was to use these lines as measuring devices that helped me check whether I was drawing everything around the joint to the appropriate size. Artists always need ways of judging relative sizes of elements they’re drawing. So with anything you draw, look for the smaller sub-units that make up the whole. You can use them to measure and also to judge whether you’re drawing angles and shapes accurately. Artists often use grids in drawing. These are another form of measuring device, and they also help you judge whether you’re drawing angles and shapes correctly. It’s always easier to judge the size and angle of a line when it’s short than when you’re trying to draw an entire object all at once. This is exactly how I’m using the joints of the fingers in my drawing. At the same time, it’s very important to remember that you must not get lost in detail at this stage. Right now, you’re just blocking out very basic shapes. Keep moving forward! Don’t get stuck on one tiny part of the whole. You will make adjustments and add details later. As you begin shading your drawing (see the video at the end of this post), it’s often easiest to look for the very darkest areas and begin there. As you can see, I use the loosest kind of pencil scribbles to shade these hand drawings. This is fine – you’re practicing. Don’t get too caught up in technique right now. Squint your eyes to see the lights and darks of your hand. If you’re lucky enough to have strong lighting on your hand, you may not need to squint much. But if the light is more even, you’ll need to squint hard! Sometimes you’ll find it difficult to see any but the darkest shadows on your hand. To create a fully-rounded appearance, you’ll need to sketch in the more medium-toned shadows as well. If you’re having trouble seeing these, look instead for the highlights on your hand – the very lightest areas. Once you see the pattern of the lightest lights, it will be easier to recognize the paler shadows around them. The next day after I did this hand sketch, I noticed that I had made the base of the hand and the large thumb knuckle too wide. So I got out my eraser and pencil and made some adjustments. I also fiddled with the shading around my fingers. You can continue “fixing” little bits of your drawing as long as you want. But it’s often more helpful to just note where you want to improve next time, and then move on to a new drawing. Keep practicing new drawings all the time! You can click through this demo at your own pace. Stop it at frames you want to study longer and move fast through other sequences. This is the second in a series of online drawing lessons using your hand as your model. The first, most basic lesson is here. The hand is so complicated visually, so able to move its parts in infinite ways relative to the various other parts, that a small movement creates new shapes and new challenges in drawing. At the end of this lesson, you’ll find a time lapse photo sequence of my entire Tutorial #2 drawing process, from my first pencil line to the finished sketch. 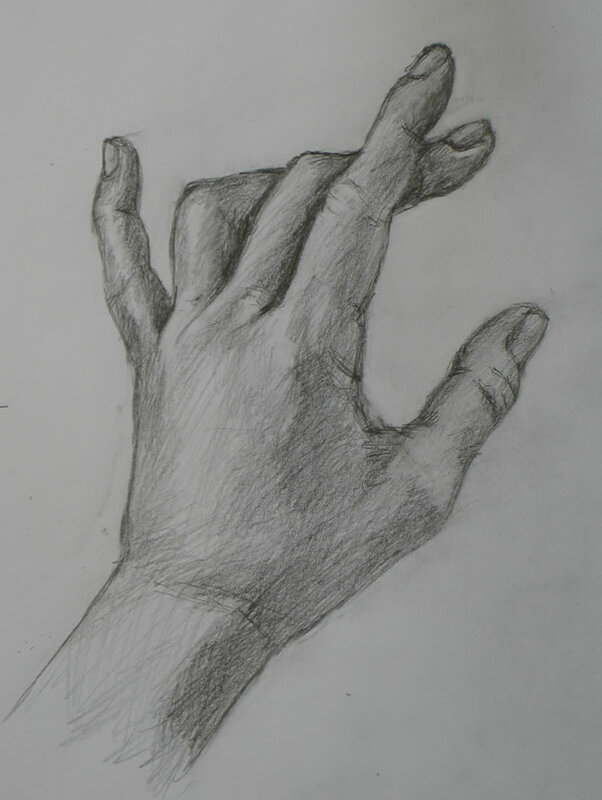 This lesson's hand sketch. You can still see a light line across the back of the hand, which I drew as a guide. You can use any paper and pencil or charcoal that you enjoy. I’ve used the same paper, pencil, and tape for this lesson as I did in the first. Please look back for specifics if you want them. My Tutorial #2 drawing (right) appears darker than the first demo, even though I used the same simple pencil and other materials. The reason is that this time, I made an effort to draw more heavily in order to make even the guidelines I sketched more visible to you. Compare the positions of the hand in Demo #1 (left) and Demo #2 (right). 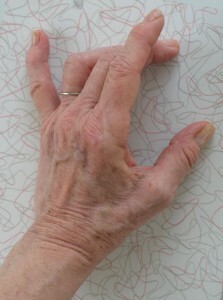 The fingers and bottom of the hand are similar. But I've raised the knuckle of my pointer finger off the table, creating a more complex subject for sketching. I also placed a strong light source (a halogen lamp) to the left side of my hand. This creates the intense lights and darks that help the artist create the illusion of three-dimensionality. 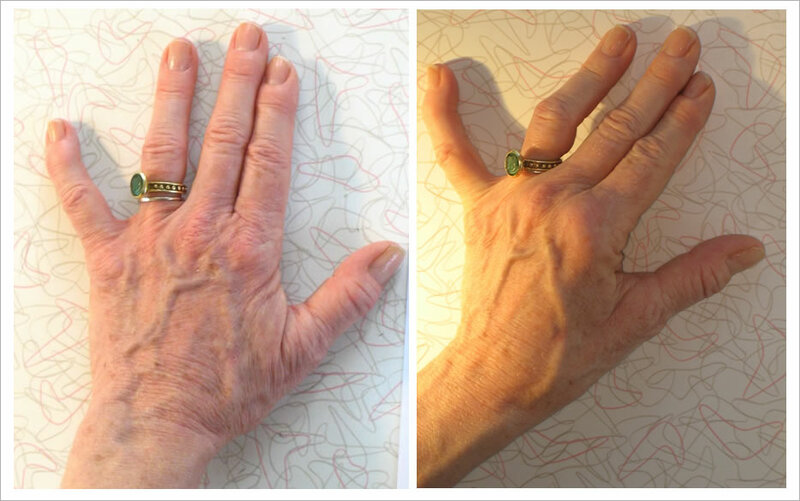 I've drawn black lines over the photos of each hand pose, outlining two spaces between fingers. Below each photo are the first lines in my drawing of the hand above it. Note that in the second drawing, I broke the negative space down into more geometric shapes (the sketched guidelines) than in the first drawing. 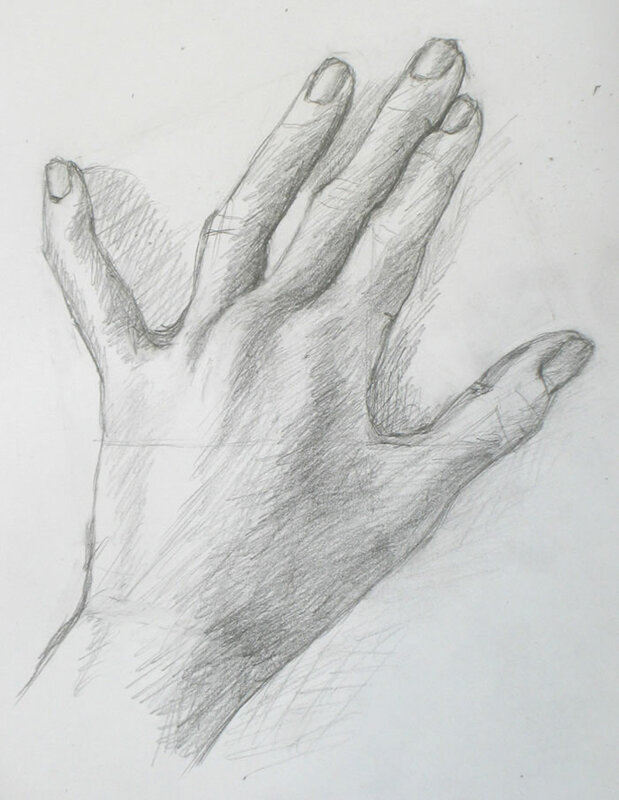 Continue “carving out” the negative space all around the hand to create its complete outline, as we did last lesson. When I’d completed the outline of my hand, it looked really off (below, left). The thumb was too large, and the entire hand seemed too stretched out to the right side. I had clearly made a mistake somewhere along the way. But what was it? What had I done wrong, and how could I correct it? Don’t worry, this kind of mistake happens all the time! What you need to do now is to look over your hand to find relationships between lines you think are correct and the areas you feel you may have gotten wrong. My first completed outline (above left) was clearly off. 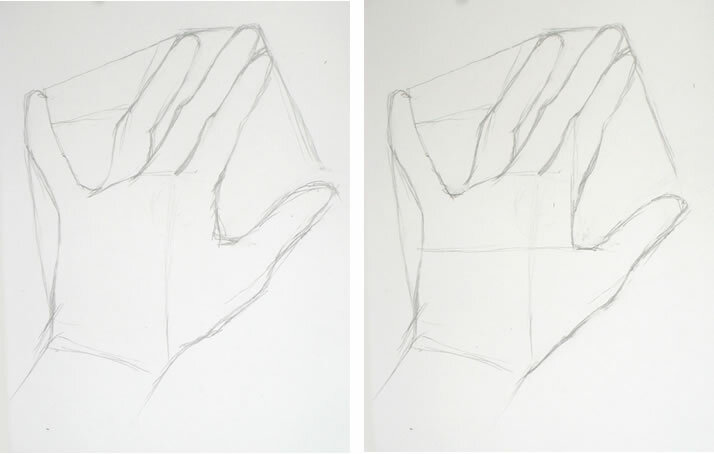 I corrected my drawing (above, right) using a horizontal guideline across the back of the hand and a vertical one intersecting it at the base of the thumb. Following this method, I realized I had mis-placed the “scoop” of negative space between the forefinger and thumb. To help you see this more easily, I’ve colored over the incorrect inner thumb line in blue (see right). 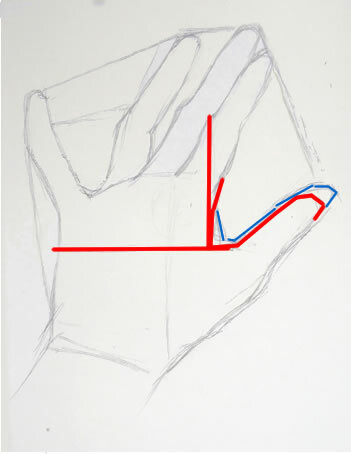 The edge of the hand between the forefinger and base of the thumb actually lies directly under the first joint of the forefinger (note my vertical guideline, right). I figured out where the horizontal portion of the thumb-base should be by drawing a horizontal line from the point on the other side of the hand directly across from it (see horizontal guideline, right). It may seem odd to figure out the placement of the thumb by looking at its relationship to the far side of the hand. But it works. And it helps you check whether your entire drawing is shaping up properly in relation to the whole. I think you’ve probably had enough technical verbiage for this lesson. So just continue from here the same way we did in Tutorial #1. It may help you to check out the time-lapse sequence of my drawing below. You can move through it at your own pace by clicking the “stop” button at the bottom when you’re ready to see the next image. First: at some point, I erased the negative-space guidelines I had drawn in the very beginning from each finger tip to the next. It’s often fun seeing guidelines like this in a finished sketch, but they were distracting me as I was trying to evaluate lights and darks for the shading. So I got rid of them. Second: this time I decided to fill in the shadows my hand cast on the table. I first considered doing this because the left side of the middle finger was so light (because of the halogen lamp) that I had nothing to define its edge. I thought I’d try defining it by the shadow next to it. Once I had started with that finger, of course I had to finish the entire shadow of my hand. I wouldn’t always do this in a quick sketch. But in this case it helped, and I liked the result.